I receive a lot of music from artists who collaborate from long distance locales and am a firm believer in the possibilities offered by such a method of creating music. Russian electronic composer and musician Artemiy Artemiev collaborates with a variety of artists and the results always leave me baffled that the participants aren't recording together in the same room. Here are four of Artemiy's newest releases. Artemiy and Peter Frohmader follow up their previous collaboration - Space Icon - with a symphonic, cinematic, spacey and trippy set of cosmic progressive rock. Both musicians share keyboard duties on Transfiguration with Frohmader also contributing guitar and bass. 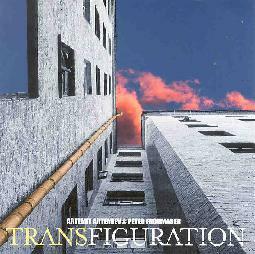 Anyone who has heard much of Peter Frohmader's music knows that he's traveled down a variety of paths from hard rock to electronics and much in between, and while things don't get too hard on Transfiguration his diverse interests do help to mix things up alongside Artemiy's symphonic keyboards. The CD is loaded with powerhouse symphonics and freaky DJ beats with spacey synths and just enough guitar and bass to pump a rock element into the music. We also hear some interesting combinations of wild beats and other off-kilter electro bits that parallel peaceful melodies and spacey synth waves. My favorite parts consist of potent symphonic keyboard driven progressive rock but augmented by contrasting playful patterns and highly thematic sequences. Much of this music would make an excellent soundtrack piece but includes lots of fun freaky bits as well. The CD consists of 5 tracks, capped off by the epic 30 minute closing track, a tour de force of spacey atmospherics, bleepy bubbly alien synths and heavily thematic percussion. The music drifts and pulses along as steadily developing percussive patterns and multiple layers of synths work together to create the image inducing slowly evolving theme. Recommended. Artemiy and Phillip B. Klingler's previous effort - Dreams Moving In Space - was one of Artemiy's more abstract ventures dealing with sound explorations that slowly developed basic themes. 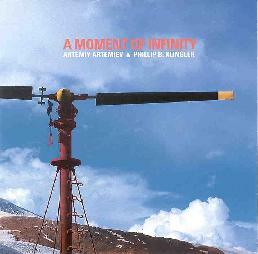 This new release - A Moment Of Infinity - continues the duo's focus on sound but is a more varied and atmospheric work. It's loaded with dark spacey backdrops and percussion and a recurring theme of ghostly and sometimes anguished voices provide the bulk of the intensity. Much of the music sounds like an avant-garde soundtrack to an expedition over a cold dark and deathly quiet landscape. The mood is eerie and unfolds gradually with the focus on painting on an aural canvas. Among the highlights is "A Rite Of Passage" which is one of the wildest tracks of the set. It's something of a freakout collage of Halloween screams and yowls, electroacoustic conglomerations, avant-Chamber music, drum n bass patterns, and intense atmospherics that flows and blends beautifully. But the real gem is the epic "In A Moment Of Infinity" which includes even more intense moans and howls on one of the albums more abstract works. I really enjoyed the prominent and varied percussion which infuses an element of sometimes startling chaos into this non-stop parade of dark atmospherics, drones, gongs, bells, and countless undefinable sounds. A fantastic voyage of sound that will keep you spellbound throughout it's entire 27 minute length. Don't listen to this in the dark on Halloween if you have a weak heart. Another recommended set. 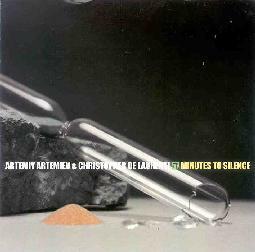 57 Minutes Of Silence is Artemiy's first collaboration with Seattle, Washington based artist Christopher De Laurenti. I'd first heard De Laurenti on one of the Electroshock compilations and this album is very different from the symphonic Vangelis styled music heard on that track. In stark contrast to it's title, 57 Minutes Of Silence includes some of the harshest works I've heard from Artemiy. Relatively short tracks like "A Glimpse" treat us to an ear piercing array of sounds. "Conlon's Dub" is an avant-tribal electro percussion dance around the campfire. "Aboard The Coalfire" is a gorgeously chaotic piece that brings to mind a spaceship crashing into a symphony hall. And "Recalibration" is a subtle and often quiet blend of static, noise, and the swirl and hum of aircraft engines. But there are also two lengthy tracks in which the duo take time to stretch out. "Transmission From The Coalfire" begins with quietly flowing orchestral atmospherics that include an underlying flying saucer spiraling wildly. The music drifts along peacefully for about 5 minutes at which point the volume and intensity levels rise as sweeping waves of sound like wind blasting through a cave crashed into my ears, rumbling in my eardrums and pulsating in my brain. There's not really a lot happening but it's the physical effect that makes this sound sculpture stand out. I found myself dodging and weaving (with hand firmly on the volume control) as rushing waves of sound quickly but fluidly transformed from ambient to whistling to almost mind shattering. They hover like a tornado deciding which way to turn... then suddenly twist and dart off causing massive destruction. "Received Through The Nebula" is a similar but far more ambient and understated work. The artists paint an aural landscape of spacey atmospherics, and the listener need only sit back and enjoy the ride. Some very interesting ideas and effects though overall this album didn't excite me as much as the others. 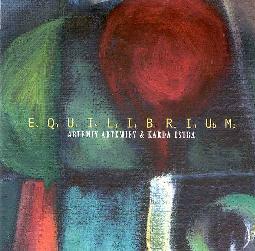 Finally we have Equilibrium, Artemiy's collaboration with Karda Estra, a British trio lead by guitar/bass/keyboard musician Richard Wileman and augmented by Iliesha Bailey on haunting vocals and Caron Hansford on oboe, percussion and effects. I've long been aware of Karda Estra and they seem to have an extensive catalog of releases though I've yet to hear any of them. But it's great to hear Artemiy collaborating with a guitarist and the result is another one of his more progressive rock oriented albums, and surely one of the most purely musical of his four recent releases. The album opens with "Preliminary Steps", a soundscape piece with Wileman contributing wailing, whining and shimmering guitar licks against Artemiy's patented image conjuring atmospherics. Ethereal voices offer a haunting coloring to the environs and light percussion provides a rhythmic base which carries the music along. "Last Scene On Earth" is a slowly building ambient-orchestral piece that combines symphonic passages with Wileman's soundscape guitar. "Open Window" is where we start to get more overtly into progressive rock territory. The music is built on an ambient foundation while guitars and varied keyboard stylings create a structured piece of symphonic prog with captivating melodies but also lots of freakiness that defies easy comparisons. Of course the album wouldn't be complete without a couple of epic length tracks. "The Teller Of The Tale" sounds like an actual band and there's a clear Rock element to the music which is simultaneously jamming and atmospheric... freeform and drifting yet evolving in a determined linear fashion. Ambient symphonics and multiple layers of guitars gradually build tension as this 19 minute track progresses. Wileman contributes a variety of guitar sounds which serve diverse roles. The soundscape ambience contributes to the mood of the piece, his more distinct style creates the melodies, and his completely spaced guitar provides tension and a welcome cosmic turbulance to the music. My favorite track on the album. Finally, "The Curtain Falls" consists of dark chamber music that sounds like a spacey fusion of Univers Zero and Vangelis, if you can imagine that. We hear a deep bass reminiscent of Magma or Present, lightly scratching but oh so noticeable guitar strings, and a killer combination of mood and melody that results in an avant-progressive soundtrack symphony for the mind. Overall this is a varied album that is sometimes simply enjoyable but at it's heights is entrancing.